Born in Winchester, England, on 14 June, 1865, he initially trained as an architect in the office of his uncle, Joseph Morris, in Reading. He later concentrated on graphic design, becoming the sub editor of the magazine Black & White, in 1891, and in 1893, became the Art Director of the famous Glasgow firm of publishers, Blackie & Sons. He was responsible for the illustrations and bindings of the firm�s popular scientific, educational and children�s books, which confirmed him as one of the leading exponents of the Glasgow Style. He also designed furniture, stained glass, jewellery and beaten metalwork. 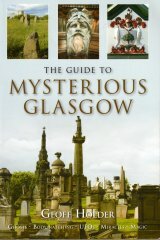 In 1910, he designed the Blackie Family Monument for the Necropolis, which was carved by J & G Mossman . A close friend of C R Mackintosh , it was Morris who introduced the architect to Walter Blackie, a meeting which culminated in the commission for Mackintosh�s finest domestic building, Hill House, in Helensburgh. Morris lived at Dunglass Castle, Bowling, for which he designed his own interiors and furnishings. He exhibited examples of his work at Turin and Budapest in 1902. Morris died in 1911, and was buried in Dumbarton Cemetery. His monument there was designed by Mackintosh.